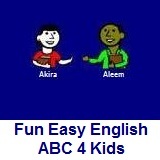 ﻿ Fun Easy English - new writing english alphabet for kids letter b. Hey kids, try writing the letter B.
I can balance a soccer ball on my head. Sometimes I eat a bagel in the morning. Baseball is a fun game to play. Bowling is a fun game too.